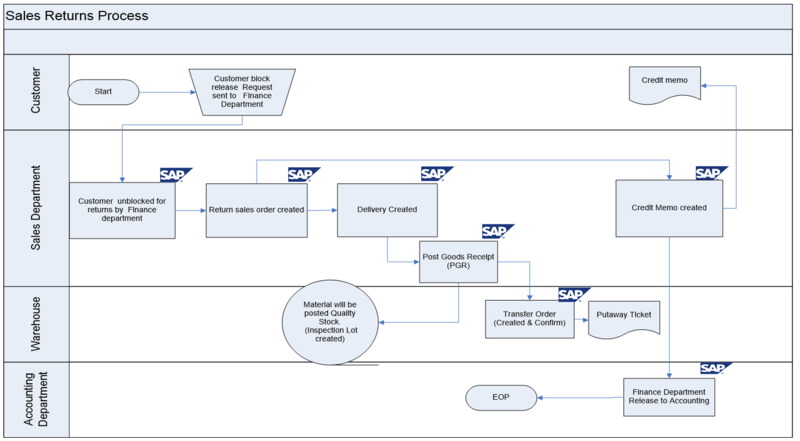 The purpose of this post is to create the Business Blueprint definition for Sales Return (Standart) procedure in SAP SD required by the company you work with. Customers may return the stocks due to various reasons viz. wrong quantity, product damages, batch shelf life, delayed delivery, wrong item, expired samples and closing customer account. Return sale order is created in SAP R/3 with reference to the initial billing document by sales operations department. Prices will be copied from the referred billing document. If the Return Sales Order is created without reference to an initial Billing Document, the Prices will be determined from the Condition Records. A delivery document is created with reference to the return sales order number by sales operations department. The Post goods receipt would be carried out with reference to the delivery document by the shipping department & stock is posted into the quality stock. A billing document (Credit memo) is created with reference to the return sales order. A copy of credit memo would be printed and sent to the Customer.